Provide comfort for the family of Shannon Condon with a meaningful gesture of sympathy. 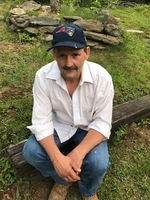 Shannon P. Condon, age 47, of Washington, passed away unexpectedly on January 9, 2019 at his home. Shannon was born on May 5, 1971 to Maurice B. Condon, Sr. and Arlene M. (Collins) Condon in Augusta, Maine. He grew up in Washington, Maine and attended Prescott Memorial School and Medomak Valley High School. Shannon worked at Med-o-lark Campground in Washington. He had many hobbies such as painting, wood-carving, and landscaping. He loved being around his family and grandchildren. Shannon is survived by daughter, Shawna Condon, step-daughters, Whitney Lopez and Brittany Lopez, mother of Shannon’s children, Paula Lopez, his mother Arlene M. Condon of Washington, brother, Maurice Condon Jr. of Washington, half brother Shane Collins of Chelsea, sisters, Arlene A. Condon of Washington, Jamie Condon and companion Ed Light of Windsor, brother-in-law Allen Shenett of Augusta, many grandchildren, and many nieces, nephews and cousins. He is predeceased by his father, Maurice B. Condon, Sr., brother, Steven Condon, Sr., sister, Leann Condon Shenett, and niece, Mikalya Glidden. The family will honor Shannon privately at a later date. We encourage you to share your most beloved memories of Shannon here, so that the family and other loved ones can always see it. You can upload cherished photographs, or share your favorite stories, and can even comment on those shared by others. Provide comfort for the family of Shannon P. Condon by sending flowers. Shannon was a great man, father, son, brother, and friend. He LOVED his family more than life itself! He was always talking about them and tried hard to make a great life for them all. I will miss his grin and his constant happiness when life was good for him. So sorry for your loss.